This case study is written by Blaise Moritz, Vice President of Customer Experience for The Princeton Review. The Princeton Review is a global education company, headquartered in the United States. Best known for preparation programs that for standardized tests, the company’s mission is to provide supplemental services that help students achieve their education goals. As part of the delivery of its service, The Princeton Review’s maintains a network of several thousand part-time instructors. Instructors teach many different programs simultaneously, including: both in person and online programs; both individually and team taught programs; and both pre-scheduled and flexibly scheduled programs. Instructors are busy, and have complex schedules! To manage the many complexities of instructor scheduling, The Princeton Review needed an online calendar that could give administrators flexible access to the schedules of one, some, or all instructors while also giving instructors access to their individual calendars. An import feature would be critical because the information to be displayed on the calendar had to be entered in existing company database first to support other needs. Also, permissions needed to be set up such that instructors could add certain sessions without overwriting sessions entered by administrators. And finally, this needed to be a communication tool with options such as triggered communication via email for new and updated cities, and the option for instructors to integrate with their other online calendars. And there are many different scheduling variables. There are morning, evening and weekend schedules. There are new courses starting every 1-2 weeks at the beginning of the summer. Some instructors are able to travel to more than one location, while some aren’t. Some instructors cover many schedules, some instructors want to teach one schedule at a time. Some instructors are able to teach more than one subject. All of the instructors have other teaching commitments for The Princeton Review and, in many cases, for other institutions. And inevitably changes need to be made. Instructors fall ill, new conflicts come up, location issues come up. Only Teamup offered a combination of a familiar, user friendly interface with powerful features that met The Princeton Review’s needs. Teamup’s features proved to be much more flexible than those of other providers. Both in terms of its look and feel and in terms of functionality, Teamup is similar to other familiar online calendar applications which made it very easy for staff to get up-to-speed with using it. More importantly, it met The Princeton Review’s needs in terms of functionality. 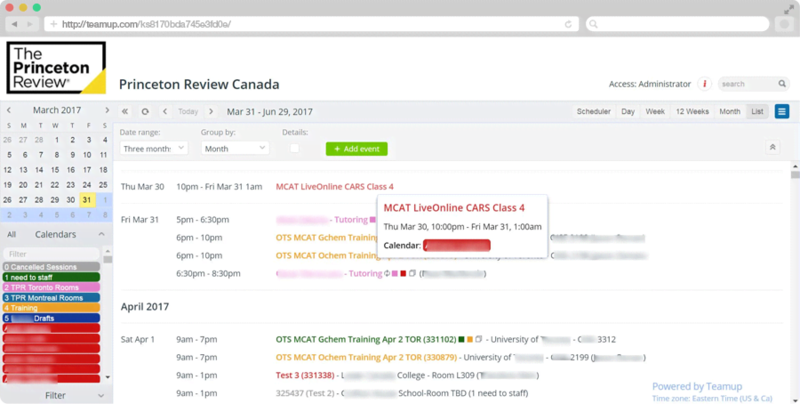 The sub-calendar features is perfect for the needs described above, allowing individual calendars to be created for each instructor within a master calendar accessed only by administrators. Each instructor can view a calendar, adding information but not deleting information entered by administrators. Administrators can view as many or as few calendars at a time. For administrators, the list view and the search functionality combine to tackle many challenges. The search function can pull up groups of sessions based on any criteria—instructor name, course number, course location, date, etc. Administrators often need different views to solve different scheduling challenges. And a traditional calendar view isn’t always best when there is a lot of information involved. The ability to switch to a list view is very useful, and there are helpful features such as pop-ups when hovering over session descriptions that reveal additional details. 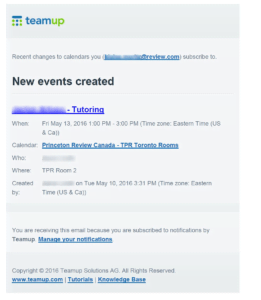 The Princeton Review makes extensive use of the import feature since Teamup is populated with session information from another database. Teamup has excellent documentation about the import that enabled us to figure out how best to format the information including how to make sure that time information would show up correctly for users in different time zones. Teamup offers several communication options which are perfect for our workflow. Pre-Teamup, administrator would rely on email exchanges to confirm schedules with instructors, often involving cumbersome processes with various kind of documents and issues with version control. With Teamup, administrators enter draft schedules into an instructor’s sub-calendar. Throughout the scheduling process and during the course, administrator and instructor are always looking at the same schedule eliminating any confusion. Then, when changes do need to be made, Teamup can be configured to send an email alert to the instructor so that there is no need for the administrator to send a separate email. For ongoing maintenance of scheduling, the instructor receives a daily digest of sessions for the day, and has the option of feeding Teamup data into other online calendar applications if the instructor chooses. The Princeton Review reviewed many calendar options. Many of these options were well known and powerful, but often turned out to serve fairly specific industries. Many of the features were built to handle high volumes of data but only if the teams being organized worked traditional types of shifts and were essentially full-time workers with few commitments outside of the work hours being organized. Teamup has contributed to increased productivity for our administrators and a better work environment for our instructors. The Princeton Review had used many creative solutions to manage challenges and prevent negative outcomes such as instructors not showing up for sessions because of lack of visibility into scheduling or confusion over scheduling. Teamup has been one of the most effective tools because it has greatly reduced the time and labour involved in meeting the challenges while actually improving the outcomes. Note by Teamup – Thank you Blaise for sharing this great use case. We appreciate the opportunity to be of service to a global community of educators and look forward to contributing more to the efficiency in educational scheduling and communication.